Nestled in California’s Central Valley, Sacramento is a thriving city with a population of over 1.5 million people. 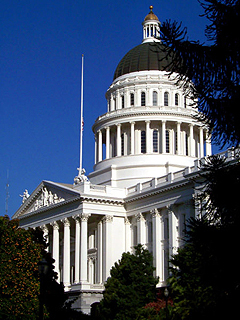 The capital of the state, Sacramento is the seventh most populous city in California. It’s no wonder that Sacramento continues to grow: it is one of the West’s most affordable and most attractive cities. Often called the River City, Sacramento sits at the confluence of the Sacramento and American Rivers. These rivers factored heavily in the development of Sacramento as the California Gold Rush started along these banks. Though gold paved the way in Sacramento, agriculture is a mainstay of the Sacramento/Central Valley economy. With a Mediterranean climate with mild winters and dry, warm summers, Sacramento boasts abundant crops of fruit, rice, nuts and wine grapes. With rare snowfall and a temperate climate, the Sacramento area has also become an ideal place to raise a family. In addition to being the center of government for the state, Sacramento is the economic heart of the four-county Sacramento Metropolitan Area. With about 2 million residents, the Greater Sacramento area is the fourth-largest in the state of California. Jobs and housing continue to boom to accommodate this growing population. It’s no wonder that people flock to the area: Greater Sacramento has been cited as one of the five “most livable” regions in the country, with Time magazine identifying it as the most integrated city in America. Even with great weather, jobs and great neighbors, Sacramento has much more to offer its residents and visitors. While people move to Sacramento for its livability, they stay for the quality of life. Sacramento is a mecca for entertainment and culture. With theatre, music, museums, film festivals and sporting events available year-round, Sacramento residents can experience world class entertainment without leaving the pristine Central Valley. This unique combination of history, natural beauty, livability and cultural opportunities is unparalleled in the rest of the country and truly makes Sacramento the place to be! The oldest incorporated city in California, Sacramento was founded in 1849, at the peak of the California Gold Rush. The history of the Sacramento area begins long before this as Nisenan and Plains Miwok Indians inhabited the Sacramento valley for possibly thousands of years prior to European Settlement. In the early 1800’s, Spanish explorer Gabriel Moraga discovered and named the Sacramento Valley and Sacramento River after the Spanish word for “sacrament,” sacramento, referring to the Roman Catholic sacrament of the Eucharist. Swiss pioneer John Sutter arrived in the Sacramento area in August of 1839. Along with a small band of settlers, he established the trading colony and stockade Sutter's Fort in 1840. Sutter planted 2,000 fruit trees in 1847, starting the agriculture industry in the Sacramento Valley. The prospects of the valley hit pay dirt, literally, in 1848 when gold was discovered at Sutter's Mill in Coloma, located some 50 miles northeast of the fort. Prospectors or “Forty-Niners” came by boat and covered wagon to the area, causing the first population boom in Sacramento. During the California Gold Rush, Sacramento was a major distribution point, a commercial and agricultural center, and a terminus for wagon trains, stagecoaches, riverboats, the telegraph, the Pony Express, and the First Transcontinental Railroad. This economic and population center was incorporated as the City of Sacramento in 1849. Much of the old town remains a vital part of today’s Sacramento. When first mapped, the city contained 26 lettered and 31 numbered streets (from C St. to Broadway and from Front St. to Alhambra Blvd.). Old Sacramento, Sacramento’s popular tourist destination, is gives visitors a glimpse of life in early Sacramento, with authentic “bonanza-style” buildings and wooden sidewalks. Also of historic interest is the Eagle Theatre, a reconstruction of California's first permanent theatre in its original location. Sacramento is a mecca for arts and entertainment in California’s Central Valley. Theater thrives in Sacramento, with several major venues. Among these are the Community Theatre, Memorial Auditorium and Wells Fargo Pavilion, run by the Sacramento Convention Center. The Sacramento Ballet, Sacramento Philharmonic and Sacramento Opera perform at the Community Center Theatre. The Sacramento area has one of the largest collections of smaller Community Theatres in California. Some of these include the 24th Street Theatre, River City Theatre Company, Runaway Stage Productions, Magic Circle Theatre, Big Idea Theatre, Celebration Arts, Lambda Player, Synergy Stage and the historic Eagle Theatre. Many of these theatres compete annually for the Elly Awards overseen by The Sacramento Area Regional Theatre Alliance or SARTA. 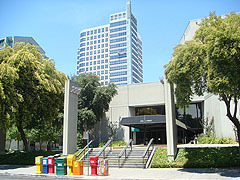 The Sacramento Convention Center is the place for conferences and special events in the Central Valley area. Located in the heart of downtown, across the street from the State Capitol complex, the Convention Center offers over 134,000 square feet of meeting and exhibit space. The facility is conveniently located near shopping, dining and other entertainment venues downtown. In recent years, capacity audiences have enjoyed performances by world-renowned artists such as Jerry Seinfeld, Bill Maher and Harry Connick Jr. -- as well as sold-out multi-week engagements of "Mamma Mia", "The Producers" and Disney's "The Lion King". The commission provides several art and cultural programs to city residents throughout the year. These include Art in Public Places, Arts Education, Grants and Cultural Programs, Poet Laureate Program, Arts Stabilization Programs and Other Resources and opportunities. Sacramento Second Saturday Art Walk is a program of local art galleries that stay open into the late evenings every second Saturday of each month providing a unique experience for the local population as well as tourists to view original art and meet the artists themselves. The oldest public art museum west of the Mississippi River, the Crocker Art Museum house an excellent collection of early California art as well as an old master drawing collection containing works by Rembrandt, Durer and Boucher. Named for the donor of its main collection, Judge E.B. Crocker, the Crocker’s holdings have grown to over 14,000 pieces. Home to the California Hall of Fame, The California Museum for History, Women, and the Arts is a cultural destination dedicated to telling the rich history of California and its unique influence on the world of ideas, innovation, art and culture. The Museum educates tens of thousands of school children through inspiring programs, sharing with world visitors California's rich art, history and cultural legacy through dynamic exhibits, and serving as a public forum and international meeting place. Its 30 concert venues stretch from Sacramento's cosmopolitan Convention Center, with its luxury hotels, to quaint Old Sacramento's boardwalks and cobblestones. About 100 performing groups, in more than a dozen Jazz genres, come to Sacramento each Memorial Day Weekend to entertain our 70,000 visitors - about 900 separate performances over the weekend, and feature some of the most noted jazz musicians in the world. It presents a lot of traditional jazz, but also swing, blues, zydeco, barbershop, ragtime and mainstream jazz, along with a number of specialty acts. The Sacramento French Film Festival is an annual event held in July. It celebrates the present as well as the rich history of French cinema featuring new releases and rarely seen classics. It is the only festival dedicated to French cinema in Northern California and one of only two on the West coast. The SFFF opens each year on a Friday night with a catered reception followed by the opening film. Films continue all day long Saturday and Sunday for two consecutive weekends. Midnight movies are presented on Saturdays for mature audiences. The Festival ends on a Sunday night with an informal champagne cocktail following the closing film. There are many recreational activities that Sacramento offers, such as white water rafting, skiing, golfing, bicycle trails, etc. To view some links that will lead you to more information on Sacramento Recreation, please visit my Relocation Page. You haven’t fully experienced basketball until you have seen a game live! Home to two professional basketball teams, the NBA’s Sacramento Kings and the Sacramento Monarchs of the WNBA, Sacramento’s ARCO Arena is a great place to see exciting live action on the court. Several smaller leagues have and continue to be in Sacramento. 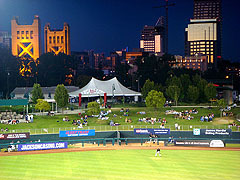 The Sacramento River Cats of Minor League Baseball play on the Raley Field, located in West Sacramento. The Sacramento Heatwave of the American Basketball Association currently plays at Natomas H. S. Event Center. In the past, the city hosted three professional football teams, the Sacramento Surge of the World League of American Football, the Sacramento Gold Miners of the Canadian Football League, and the Sacramento Attack of the Arena Football League. Sacramento was also home to an indoor soccer team, the Sacramento Knights of the Continental Indoor Soccer League (later called the World Indoor Soccer League). The Sacramento River Rats of Roller Hockey International also played in the city for several years. The Sacramento XSV (pronounced "excessive") of the National Professional Paintball League are based in Sacramento. Sacramento has frequently hosted the NCAA Men's Outdoor Track and Field Championship as well as the 1st and 2nd rounds of the NCAA Men's Division I Basketball Championship. The Sacramento Mile is a national flat-track motorcycle racing event. From 1961 to 1980, Sacramento hosted the Camellia Bowl, which selected or helped select ten national champions in college football's lower divisions. In amateur sports Sacramento claims many prominent Olympians such as Mark Spitz, Debbie Meyer, Mike Burton, Summer Sanders, Jeff Float (all swimming), and Billy Mills (track). Coach Sherm Chavoor founded his world famous Arden Hills Swim Club just east of the city and trained Burton, Myer, Spitz and others.